Sample shown on White stock with Gold ink and Emerald envelope lining. Sample shown on Ivory stock with Violet ink and Eggplant envelope lining. Sample shown on White stock with Silver ink and Onyx envelope lining. Sample shown on Ivory stock with Violet ink. 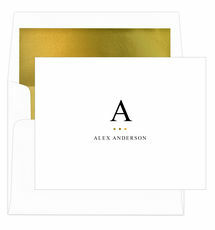 Set of flat note cards with your initial featured above a modern indicator design. Your choice of paper weight and color. Cards measure 6.25" x 4.5". Matching blank envelopes included. Your choice of raised ink color. Envelope lining and printed return address available. Positioning only as shown.